Crude oil prices picked up a strong bid yesterday after US sanctions on Venezuelan exports triggered worries over disruptions of supply. However, according to Reuters, Rystad Energy believes that Venezuelan supplies will not be eliminated, but would be rerouted to other countries. On the other hand, API weekly Crude oil stock dipped from previous 6.55M to 2.098M in January 25 boosting more the prices. Now the only fear relays on Sino-US trade war and the pale demand in Europe would drag down global growth and fuel consumption are likely capping upside. Crude oil prices surged by more than 2% from yesterday till now after picking up a strong bid after dipping towards the $51 area. 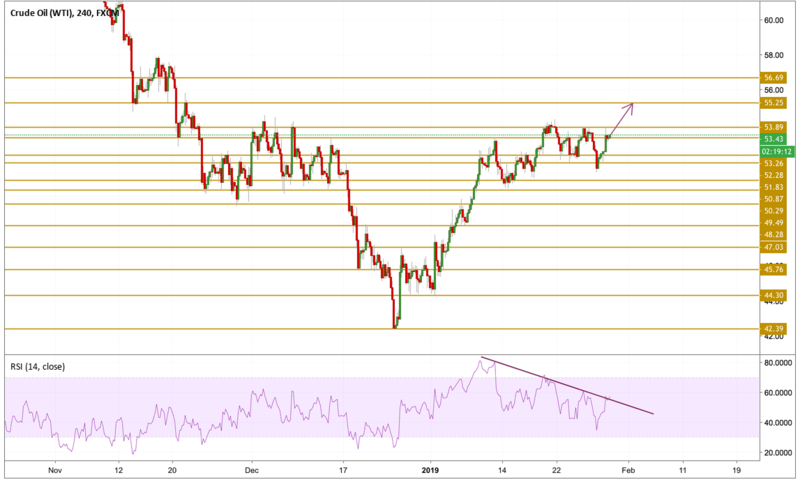 The price is currently hovering just above the 53.26 support level and the RSI points towards a breakout which can result to a strong upward movement with the help of a bullish momentum. The prices are more likely to break above recent highs and our next level to watch will be the 55.25 resistance level.